NEITHER CLEANWAVE LABS, LLC (THE “COMPANY”) NOR THE MEMBER INTERESTS THEREIN HAVE BEEN OR WILL BE REGISTERED UNDER THE SECURITIES ACT OF 1933, AS AMENDED, THE INVESTMENT COMPANY ACT OF 1940, AS AMENDED, OR THE SECURITIES LAWS OF ANY OF THE STATES OR TERRITORIES OF THE UNITED STATES. THE OFFERING OF SUCH MEMBER INTERESTS IS BEING MADE IN RELIANCE UPON AN EXEMPTION FROM THE REGISTRATION REQUIREMENTS OF THE SECURITIES ACT OF 1933, AS AMENDED (THE “SECURITIES ACT”), FOR OFFERS AND SALES OF SECURITIES WHICH DO NOT INVOLVE ANY PUBLIC OFFERING, AND ANALOGOUS EXEMPTIONS UNDER STATE SECURITIES LAWS. THE DELIVERY OF THIS OPERATING AGREEMENT SHALL NOT CONSTITUTE A RECOMMENDATION OF ANY KIND, NOR SHALL IT CONSTITUTE AN OFFER TO SELL OR THE SOLICITATION OF AN OFFER TO BUY NOR SHALL THERE BE ANY OFFER, SOLICITATION OR SALE OF MEMBER INTERESTS IN THE COMPANY IN ANY JURISDICTION IN WHICH SUCH OFFER, SOLICITATION OR SALE IS NOT AUTHORIZED OR TO ANY PERSON TO WHOM IT IS UNLAWFUL TO MAKE SUCH OFFER, SOLICITATION OR SALE. THESE SECURITIES ARE SUBJECT TO RESTRICTIONS ON TRANSFERABILITY AND RESALE, MAY NOT BE TRANSFERRED OR RESOLD EXCEPT AS PERMITTED UNDER THE SECURITIES ACT, AND APPLICABLE STATE SECURITIES LAWS PURSUANT TO REGISTRATION OR EXEMPTION THEREFROM AND MAY NOT BE SOLD OR OTHERWISE TRANSFERRED EXCEPT IN ACCORDANCE WITH THE REQUIREMENTS AND CONDITIONS SET FORTH IN THIS OPERATING AGREEMENT. 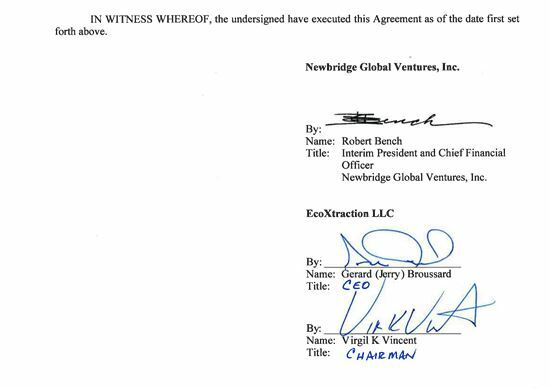 This operating agreement (this “Agreement”) of CleanWave Labs, LLC, a Nevada limited liability company (the “Company”), is entered into as of February 15, 2019, by and between Newbridge Global Ventures, Inc. (“NBGV”), a Delaware corporation, and EcoXtraction LLC (“EcoX”), a Louisiana limited liability company (referred to individually as a “Member” and collectively as the “Members”). WHEREAS, EcoX shall grant NBGV a non-exclusive license, in perpetuity and for NBGV’s personal use, to EcoX’s intellectual property rights specific to water extraction as set forth in the License Agreement attached as Exhibit A hereto (the “License Agreement”) and an exclusive license for two years to market the water extraction intellectual property owned by the Company with certain extending options pursuant to the License Agreement. WHEREAS, the Members desire to enter into this Agreement to set forth their respective agreements as it pertains to the business of the Company, their rights and liabilities as members, to provide for the management and operation of the Company’s business, and to provide for certain other matters, all as permitted under the NLLC. 1.1. Definitions. The following defined terms as used in this Agreement shall, unless otherwise defined herein, each have the meaning set forth in this Article 1. “Accounting Period” means the period beginning on the day immediately succeeding the last day of the immediately preceding Accounting Period (or, in the case of the first Accounting Period, beginning on the date of this Agreement) and ending on the earliest to occur of the following: (i) the last day of the Fiscal Year; (ii) the day immediately preceding the day on which a Member makes an additional contribution to, or a full or partial withdrawal from, its Capital Account; (iii) the day immediately preceding the day on which a new Member is admitted to the Company; or (iv) the date of termination of the Company in accordance with Article 10 of this Agreement. “Additional Capital Contributions” is defined in Section 3.3(b)(i) hereof. “Affiliate” means, with respect to any Person, any other Person that directly or indirectly through one or more intermediaries, controls, or is controlled by, or is under common control with, such particular Person. For purposes of this definition, “control” (including, with correlative meaning, the terms “controlled by” and “under common control with”), as used with respect to any Person, shall mean the possession, directly or indirectly, of the power to direct and cause the direction of the management and policies of such Person, whether through the ownership of voting securities, by contract, or otherwise. “Agreement” means this Operating Agreement and all amendments thereto. “Annual Budget” is defined in Section 3.7. “Articles of Organization” means the Articles of Organization of the Company, as the same may be further amended from time to time, as filed on or about February 15, 2019 with the Secretary of State of Nevada. “Available Cash” for each Fiscal Year shall mean the net income of the Company (treating the net loss of the Company as negative net income) as it is determined for federal income tax purposes plus the sum of (a) the Company's depreciation and amortization deductions claimed for federal income tax purposes for such year, (b) any other non-cash charges deducted in determining said federal net income for such year, and (c) any non-taxable cash receipts of the Company for such year (other than the proceeds of capital contributions or loans to the Company and the cash proceeds of any sales or other dispositions of any of the assets of the Company other than those sold in the ordinary course of the Company’s business) and decreased by the sum of (w) repayments during such year on all obligations of the Company or which otherwise encumber the property of the Company (other than in connection with a refinancing), including repayments of loans made by any Member to the Company, (x) any other cash expenditures made during such year which are not deducted in computing the net income of the Company for federal income tax purposes (other than those funded with the proceeds of loans, capital contributions or sales), (y) any non- cash receipts of the Company for such year attributable to any property owned by the Company to the extent included in the net income of the Company for federal income tax purposes for such year, and (z) the amount required to maintain the cash balance of the Company at an amount not in excess of the amount reasonably deemed necessary for the Company's business in the discretion of the Managers. “Bankruptcy” means, with respect to any Person, (i) making an assignment for the benefit of creditors, (ii) filing a voluntary petition in bankruptcy, (iii) becoming the subject of an order for relief or being-declared insolvent in any federal or state bankruptcy or insolvency proceeding (unless such order is dismissed within ninety (90) days following entry), (iv) filing a petition or answer seeking for itself any reorganization, arrangement, composition, readjustment, liquidation, dissolution or similar relief under any statute, law, or regulation, (v) filing an answer or other pleading admitting or failing to contest the material allegation of a petition filed against it in any proceeding similar in nature to those described in the preceding clause, or otherwise filing to obtain dismissal of such petition within one hundred twenty (120) days following its filing, or (vi) seeking, consenting to, or acquiescing in, the appointment of a trustee, receiver, or liquidator of all or any substantial part of its properties. “Business Day” means any day other than Saturday, Sunday or other day on which commercial banks in the State of Nevada are authorized or required to close. “Capital Account” means as to any Member, such Member’s Capital Contributions (i) increased by his share of Net Profits and (ii) reduced by his share of (w) Net Losses and (x) distributions and withdrawals of cash or the fair market value of assets distributed to or withdrawn by such Member. “Capital Contributions” means the sum of the amount of cash, if any, plus the aggregate value of all tangible or intangible property contributed by a Member, and accepted by the Managers, to the capital of the Company including, without limitation, any amounts paid by a Member (except to the extent indemnification is made by another Member) in respect of any claims, liabilities, or obligations of or against the Company and/or pursuant to any guaranty of any Company indebtedness by such Member. “Cause” is defined in Section 9.8(a). “Certificate” is defined in Section 11.3(a). “Closing Capital Account Balance” is defined in Section 4.2 hereof. “Code” means the Internal Revenue Code of 1986, as amended (or any corresponding provision of succeeding law). “Come-Along Notice” is defined in Section 10.6(a) hereof. “Company” means CleanWave Labs, LLC, or its successor. “Consent” means the prior written approval of a Person to do the act or thing for which the consent or approval is solicited, or the act of granting such consent or approval, as the context may require. “Damages” means any and all damages, disbursements, suits, claims, liabilities, obligations, judgments, fines, penalties, charges, amounts paid in settlement, costs and expenses (including, without limitation, attorneys' fees and expenses) arising out of or related to litigation (pending or threatened) or any investigation or proceeding by any Governmental Authority and interest on any of the foregoing. “Designated Individual” is defined in Section 8.5(a). “Disabling Event” means with respect to a Person the death, incapacity, adjudication of incompetency, bankruptcy, dissolution, liquidation, resignation, withdrawal or removal of such Person. “Disqualifying Felony” means a felony that would jeopardize or prohibit the Company’s application for, renewal of, or maintenance of any permit or license necessary to conduct Company business. “Distribution” means a transfer of money or property by the Company to its Members without consideration, as set forth in Section 5.2 hereof. “Drag-Along Members” is defined in Section 10.6(a) hereof. “Drag-Along Notice” is defined in Section 10.6(a) hereof. “EcoX” means EcoXtraction LLC, or its successor. “EcoX Designee” means Virgil Vincent, or his successor. “Effective Date” is defined in Section 9.8(a) hereof. “Election Notice” is defined in Section 9.2(b) hereof. “Family Member” or “Family Members” is defined in Section 9.1. “Fiscal Year” is defined in Section 8.4 hereof. “Governmental Authority” means any nation or government, any state or other political subdivision thereof and any other Person exercising executive, legislative, judicial, regulatory or administrative functions of or pertaining to government. “HD” is defined in Section 3.4 hereof. “Independent Designee” means John MacKay or his successor. “Initial Capital Contribution” means the purchase price paid by the Member for its Member Interests. The Initial Capital Contribution of each Member shall be made in cash and/or tangible or intangible property and shall be listed opposite such Member’s name on Schedule A hereof, as such schedule may be amended from time to time by the Managers. The Initial Capital Contribution shall include any subsequent Capital Contributions that Members may add to their respective Capital Accounts. “Intellectual Property” is defined in Section 10.4 hereof. “License Agreement” is defined in the Recitals. “Liquidator(s)” is defined in Section 10.4 hereof. “Majority in Interests” means Member Interests representing more than fifty (50%) percent of the total Member Interests issued by the Company, provided that for as long as NGBV and EcoX each hold interest in the Company, any vote or consent requiring a “Majority in Interests” shall include both NGBV and EcoX. “Managers” the initial Managers of the Company shall be Ellen Gee, John MacKay and Virgil Vincent, or any other Person or Persons who succeed them in such capacity to serve as a Manager. Ellen Gee shall be referred to as the “NBGV Designee” and Virgil Vincent shall be referred to as the “EcoX Designee”. John MacKay shall be referred to as the “Independent Designee”. “Member” means any Person who is admitted as a Member of the Company as listed on Schedule A hereto, as the same may be amended from time to time by the Managers to reflect the admission, substitution or withdrawal of any Persons as Members of the Company. The Managers may also admit non-voting and other classes of Members if they deem, in their sole discretion, that such admission will be beneficial in achieving the Company’s purposes. “Member Interest” means the entire ownership interest of a Member in the Company, regardless of class, at any particular time, including the right of such Member to any and all benefits (including, without limitation, Net Profits and Net Losses) to which a Member may be entitled pursuant to this Agreement and under the NLLC, together with all obligations of such Member to comply with the terms and provisions of this Agreement and the NLLC. For purposes hereof, if any provision requires the affirmative vote or Consent of a specified percentage of Member Interests, such percentage shall be determined by reference to the aggregate percentages of Members casting such affirmative vote calculated at the applicable date. “Member Percentage” is defined in Section 3.5 hereof. “NBGV” means Newbridge Global Ventures, Inc., or its successor. “NBGV Designee” means Ellen Gee, or her successor. “Net Profits” and “Net Losses” means, with respect to any Accounting Period, net profits or net losses, as the case may be, of the Company for such Accounting Period as determined in accordance with generally accepted accounting principles, and items of income, gain, loss, deduction or credit entering into the computation thereof and shall include any unrealized profits and unrealized losses; provided that if, in keeping with the provisions of Treasury Regulation 1.704-1(b) and Temporary Regulation 1.704- 1T(b)(4)(iv), any asset of the Company is accounted for on the Company books and in the Capital Accounts of the Members at an amount other than its adjusted basis for tax purposes, then, for purposes of accounting for such items on the Company books and in the Capital Accounts of the Members, items of income, gain, loss, deduction or credit shall be calculated based upon the carrying value of the asset on the Company books. “NLLC” is defined in the Recitals. “Notice” means a writing containing information to be communicated to any Person pursuant to this Agreement. “Offered Interest” is defined in Section 9.2(a). “Opening Capital Account Balance” is defined in Section 4.1 hereof. “Partnership Representative” shall have the meaning set forth in Code Section 6223 and shall serve in such role and manner as set forth in Section 8.5(a) hereof. “Person” means any natural person, corporation (stock or non-stock), limited liability company, limited liability partnership, limited partnership, partnership, joint stock company, joint venture, association (profit or non-profit), company, estate, trust, bank, trust company, land trust, business trust or other organization, whether or not a legal entity, and any government agency or political subdivision thereof. “Proposed Purchaser” is defined in Section 10.6(a) hereof. “Proposed Transferee” is defined in Section 9.2(a). “Redeemed Member” is defined in Section 9.8(b). “Redemption Notice” is defined in Section 9.8(a). “Redemption Payments” is defined in Section 9.8(d). “Redemption Value” is defined in Section 9.8(c). “Related Persons” is defined in Section 6.7(a). “Reserves” means the reserves established by the Managers in an amount equal to at least one Fiscal Year of the Company’s anticipated expenses, plus such additional amounts which the Managers in their sole discretion deems necessary or appropriate. The Managers may increase or reduce any such Reserves from time to time by such amounts as the Managers in their sole discretion deems necessary or appropriate. “ROFR Right” is defined in Section 9.2(b). “Sale Notice” is defined in Section 9.2(a). “Short-Term Investments” means investments in short-term Securities that the Company may invest its free cash. “Technology” is defined in the Recitals. “Third Party Sale” is defined in Section 10.6(a) hereof. “Transfer” means and includes a sale, exchange, gift, encumbrance, assignment, pledge, mortgage, and other hypothecation or disposition, whether voluntary or involuntary. “Transferring Member” is defined in Section 9.2(a). “Treasury Regulations” means regulations adopted by the Treasury Department of the United States governing application and enforcement of the Code. Any reference to a section or provision of the Treasury Regulations shall be deemed to refer also to such section or provision as amended or superseded. “Withdrawal Date” is defined in Section 9.9(b) hereof. “Withdrawal Payment” is defined in Section 9.9(b) hereof. “Withdrawing Member” is defined in Section 9.9(b) hereof. “Working Capital Contribution” is defined in Section 3.4 hereof. 2.1.Ratification of Certificate of Formation; Other Acts. The Members hereby ratify the execution and filing of the Certificate of Formation, as a result of which the Company was formed as a limited liability company pursuant to the provisions of the NLLC. The Managers shall also execute and file for record any other document(s), as well as take such other action(s), as may be required in connection with the formation, operation, or dissolution of the Company. (a)The Company has been established for the purpose of exploiting the Technology and (ii) manufacturing and marketing equipment derived from the Technology for use in extracting CBD, THC, as well as additional compounds, from cannabis and hemp plants, and to perform such other acts as may be necessary or appropriate in connection therewith or incidental thereto. (b)Notwithstanding the foregoing, no business or activities authorized by Section 2.2(a) shall be conducted if such are forbidden by or contrary to any applicable law of the State of Nevada, applicable city and/or municipal ordinances, the United States Internal Revenue Code, or to the rules or regulations lawfully promulgated thereunder. If any of the terms, conditions or other provisions of this Agreement shall be in conflict with any of the foregoing, such conflicting terms, conditions or other provisions shall be deemed modified so as to conform therewith. (c)Each Member shall cooperate in good faith, and shall do and perform, or cause to be done and performed, all such further acts and things, and shall execute and deliver all such other agreements, certificates, instruments and documents as may be reasonably requested by either Member for the furtherance of carrying out and accomplishing the purpose set forth in this Section 2.2. (a)The principal office of the Company shall be located at such location as the Managers shall determine. The Company may have such additional offices as the Managers shall deem advisable. (b)The Company shall have its registered office in the State of Nevada at 701 S. Carson Street – Suite 200, Ormsby County Carson City, Nevada 89701 and shall have National Registered Agents as its registered agent at such registered office for service of process in the State of Nevada, unless a different registered office or agent is designated from time to time by the Managers in accordance with the NLLC. 2.4.Taxation. The Members intend that the Company shall be taxed as a “partnership” for federal, state, local and foreign income tax purposes. The Members agree to take all reasonable actions, including, but not limited to, the amendment of this Agreement and the execution of other documents, as may reasonably be required in order for the Company to qualify for and receive “partnership” tax treatment for income tax purposes and agree not to take any actions inconsistent therewith. 3.1.Member Interests; Admission of Members. (a)The Company is initially authorized to issue one class of Member Interests, which shall be a Common Class. The rights, duties, and obligations of the Members of the Company shall be governed by the terms and conditions of this Agreement and shall be represented by such class. The Managers are authorized to admit additional classes of Members to the Company from time to time subject to the approval of a Majority in Interests. (b)Each Person subsequently desiring to become a Member following the Effective Date of this Agreement shall deliver to the Managers a fully executed subscription or contribution agreement together with the full purchase price for the Member Interests subscribed for, which shall bind such Person and the Company upon acceptance and execution by the Managers with respect to such number of Member Interests subscribed for as shall be accepted by the Managers. 3.2.Members. Each Member’s name, address and initial Capital Contribution shall be set forth on Schedule A. The Members shall have such relative rights, powers, preferences and limitations as are set forth in this Agreement. The Managers shall amend Schedule A from time to time without the consent of any other Member to reflect the inclusion of additional Members or additional classes of Members or to reflect any change in the identity of a Member and to delete Members that have withdrawn from the Company, in each case as permitted by this Agreement. (a)Initial Capital Contributions. The Initial Capital Contribution of each Member shall be made in cash or other assets and shall be listed opposite such Member’s name on Schedule A as such appendix may be amended from time to time by the Managers. Any Working Capital Contribution as defined in Section 3.4 shall also be considered as a Capital Contribution and such contribution shall not result in a change to the Member Percentage of any Member. The Initial Capital Contributions shall be valued as set forth in Schedule A. Any Member Interest issued to the Managers hereby shall constitute “profits interests” as that term is defined in Internal Revenue Service Procedure 93-27, 1993-2 CB 343, and the distribution provisions of this Agreement shall be interpreted in a manner consistent with such definition. The Company shall not issue the Managers any Member Interests without the consent of a Majority in Interests. (i)No Member shall be required to make any additional Capital Contributions (“Additional Capital Contributions”) to the Company, accept as provided in this Section 3.3(b). The Managers may put forth a proposal for vote of the Members for the Company to offer to all the Members the opportunity to make Additional Capital Contributions in an amount deemed appropriate by the Managers in cash or property at any time and for any time period that the Managers determine in their sole and absolute discretion in order for each Member to maintain their respective Member Interests. While the Managers have discretion to determine the amount of Additional Capital Contributions to be made, the Managers will not make such offer without the consent of the Majority in Interests. (ii)If the Managers at any time or from time to time determine to permit Additional Capital Contributions from Members, the Managers shall be required with the consent of the Majority in Interests, to give Notice to all Members that the Company is permitting Additional Capital Contributions and the date on which funds from each Member who decides to make an Additional Capital Contribution will be due and payable. (iii)At any time that Additional Capital Contributions are accepted pursuant to this Section 3.3(b), the Managers shall adjust the Member Percentages (defined below) based upon the then Capital Accounts of the respective Members, in a time frame deemed reasonable at the sole discretion of the Managers. $2,000,000 shall be considered a loan by NBGV to the Company subject to the provisions of Section 4.3(g) and the consent of a Majority in Interests. Notwithstanding the above, NBGV shall have no obligation to fund any amount in excess of the $2,000,000 Working Capital Contribution. In the event that the Company requests additional contributions, which would be treated as loans pursuant to this Section 4.3(g), the terms of such loans shall be approved by a Majority in Interests. 3.5.Member Percentage. There shall be established for each Member, as of the first day of each Accounting Period, a member percentage for such Accounting Period (the “Member Percentage”). The Member Percentage of a Member for such Accounting Period shall mean the percentage ownership of a Member, which percentage shall be determined by reference to the Member Percentage as outlined in Schedule A attached. The sum of the Member Percentages of all Members for each Accounting Period shall be equal to one hundred percent (100%). 3.6.Title to Assets. All assets and any other tangible and intangible property, owned by the Company shall be owned by the Company as an entity and no Member shall have any ownership interest in such assets or other property in the Member’s individual name or right, and each Member Interest shall be personal property for all purposes. The Company shall hold all of the assets and any other property in the name of the Company and not in the name of any Member or any Affiliate of any Member. 3.7.Annual Budgets. The Managers shall use their good faith, commercially reasonable efforts to agree, within sixty (60) days of the date hereof, on a budget (the “Annual Budget”) which shall set forth the projected income, expenses, capital expenditures and financing needs for the Company for the remaining 2019 fiscal year. On or before December 15 of each year, the Managers shall prepare and submit a new Annual Budget that shall set forth the projected income, expenses, capital expenditures and financing needs for the Company for the ensuing fiscal year. Each Annual Budget shall be approved by a Majority in Interests. Upon approval of each Annual Budget, NBGV shall fund the Working Capital Contribution in accordance with the schedule outlined in each Annual Budget, including any amendments thereto, until the full Working Capital Contribution has been funded. Any failure to fund the Working Capital Contribution in strict accordance with such schedules shall be deemed to be a material breach of this Operating Agreement. The Managers shall use their good faith efforts to operate the Company within the Annual Budget, and from time to time, the Managers may update the Annual Budget with the consent of a Majority in Interest to reflect new projected income, expenses, capital expenditures and financing needs for the then current year. 4.1.Opening Capital Accounts. The Company shall establish and maintain a Capital Account for each Member. For each Accounting Period during the term of this Agreement, the Company shall establish for each Member an opening Capital Account Balance (the “Opening Capital Account Balance”) and a Closing Capital Account Balance. The initial Opening Capital Account Balance of each Member shall be equal to such Member’s Initial Capital Contribution, provided that NBGV’s initial Opening Capital Account Balance will reflect the amounts contributed by NBGV on the date hereof, and any Working Capital Contribution reflected on Schedule A to be contributed to the Company by NBGV at a later date shall increase NBGV’s Capital Account Balance accordingly. The Opening Capital Account Balance of a Member for each Accounting Period subsequent to the Accounting Period in which such Member was admitted to the Company shall be an amount equal to the Closing Capital Account Balance of such Member, determined in accordance with Section 4.2, for the immediately preceding Accounting Period plus the amount of any Additional Capital Contributions made by such Member hereto as of the beginning of such subsequent Accounting Period. Capital Accounts are intended to be maintained hereunder, to the extent consistent with the terms of this Agreement, in accordance with Code Sections 704(b) and (c) and the Treasury Regulations thereunder. 4.2.Closing Capital Account Balance. There shall be established for each Member on the books of the Company as of the last day of each Accounting Period, a closing Capital Account Balance for such Accounting Period (the “Closing Capital Account Balance”). In order to arrive at the Closing Capital Account Balance, each Members Opening Capital Account Balance shall be (a) increased by the amount of any Additional Capital Contributions, (b) increased or decreased for allocations pursuant to Section 5.1, and then for distributions pursuant to Section 5.2, (c) decreased for the amount of any withdrawals pursuant to Section 9.9, in each case in respect of such Accounting Period, (d) decreased by the Member’s pro rata share of expenses set forth under Section 6.12(b), and (e) in the case of NBGV, increased by any Working Capital Contributions made after the date hereof in accordance with Section 3.7. (a)No Member shall have any liability to restore all or any portion of any negative Capital Account. (b)No Member shall be paid interest on the balance of its Capital Account at any time. (c)A Member shall not be required to make any Additional Capital Contributions to the Company, other than as provided in this Agreement, or to lend any funds to the Company. (d)Except as otherwise provided in this Agreement, no Member shall have any right to demand or receive (i) any cash, or Company assets in return of its Capital Contribution or the balance of its Capital Account in respect of its Member Interests until the dissolution of the Company or (ii) any distribution from the Company in any form other than cash. (e)If a Member Interest is transferred as permitted by this Agreement and effected by the Managers, the transferee shall succeed to the Capital Account of the transferor to the extent the Capital Account relates to the transferred Member Interest in accordance with Treasury Regulations Section 1.704- 1(b)(2)(iv)(l). (f)A creditor who makes a nonrecourse loan to the Company shall not have, and shall not acquire at any time, solely as a result of making the loan, any direct or indirect interest in the profits, capital or property of the Company, other than as a creditor or secured creditor, as the case may be, and the rights of such creditor shall be determined by the terms and conditions of the agreement(s) entered into between the Company and such creditor in connection with the making of such advance(s). (g)Loans by Members to the Company shall not be considered Capital Contributions. If any Member advances funds to the Company as a loan in excess of his Capital Contribution, such advances shall not increase the Capital Account balance of such Member. The amount of any such advances shall be a debt of the Company to such Member and shall be payable or collectible only out of Company assets in accordance with the terms and conditions upon which such advances as a loan are made. 4.4.Adjustments to Capital Accounts. Notwithstanding anything contained herein to the contrary, the manner in which Capital Accounts are maintained shall be modified, if necessary, in the opinion of the Managers, to comply with applicable law, provided that no such change shall materially alter the economic agreement among the Members as embodied in this Agreement. (d)have any claim to distributions (whether of cash or property) or other payments or consideration from or resulting from the liquidation of any assets that are attributable to any Member Interests other than the Member Interests held by such Member. 5.1.Allocations of Net Profits and Net Losses. (a)Allocations. Except as otherwise provided in this Article 5, as of the last day of each Accounting Period, the Net Profits and Net Losses of the Company for such Accounting Period shall be allocated to the Capital Accounts of each Member in proportion to their respective Member Percentages on that day, except that for Net Losses relating to the either of the first two Accounting Periods, to the extent that EcoX is, in its good faith judgement, unable to utilize such Net Losses (including on a carryforward or carryback basis), the EcoX portion of Net Losses for the applicable Accounting Period will be allocated to NBGV. (b)General Allocations for Income Tax and Accounting Purposes. For each Accounting Period, items of income, deduction, gain, loss or credit shall be allocated for income tax purposes among the Members in such manner as to reflect equitably amounts credited or debited to each Member’s Capital Account for the current and prior Accounting Periods. Such allocations shall be made pursuant to the principles of Sections 704(b) and 704(c) of the Code and the Treasury Regulations promulgated thereunder. (i)Company Minimum Gain Chargeback and Member Minimum Gain Chargeback. The Company shall allocate items of income and gain among the Members at such times and in such amounts as necessary to satisfy the minimum gain chargeback requirements of Treasury Regulation Sections 1.704-2(f) and 1 .704-2(i)(4). (ii)Allocation of Deductions Attributable to Member Nonrecourse Liabilities. Any nonrecourse deductions attributable to a Member Nonrecourse Debt (as defined in Treasury Regulation Section 1.704-2(b)(4)) shall be allocated among the Members that bear the economic risk of loss for such Member Nonrecourse Debt in accordance with the ratios in which such Members share such economic risk of loss and in a manner consistent with Treasury Regulation Sections 1.704-2(i) and 1.704- 2(j). (iii)Qualified Income Offset. No Net Losses shall be allocated to a Member if such allocation would cause or increase a deficit in such Member’s Capital Account after crediting to such Capital Account any amounts which such Member is deemed obligated to restore under Treasury Regulation Sections 1.704-2(g)(1) and 1.704-2(i)(5) in respect of the Member Interests held by the Member. In addition, the Company shall specially allocate Net Profits (or items of income and gain) when and to the extent required to satisfy the “qualified income offset” requirement within the meaning of Treasury Regulation Section 1.704-1(b)(2)(ii)(d). Accordingly, if a Member unexpectedly receives an adjustment, allocation or distribution described in Treasury Regulation Section 1.704-1(b)(2)(ii)(d)(4), (5) or (6) in respect of the Member Interests held by the Member, such Member will be allocated items of income and gain (consisting of a pro rata portion of each item of Company income, including gross income and gain for a Fiscal Year) in an amount and manner sufficient to eliminate a deficit balance as quickly as possible. (iv)Allocations of Deductions Attributable to Nonrecourse Liabilities. Any Company Nonrecourse Deductions (as defined in Treasury Regulation Section 1.704-2(b)(l)) shall be specially allocated to the Members in accordance with the Members’ respective Member Percentages within the meaning of Treasury Regulation Section 1.704-2(b)(1). It is the intention of the Members that the allocations hereunder shall be deemed to have “substantial economic effect” within the meaning of Section 704 of the Code and Treasury Regulation 1.704-1. Should the provisions of this Agreement be inconsistent with or in conflict with Section 704 of the Code or the Treasury Regulations thereunder, then Section 704 of the Code and the Treasury Regulations shall be deemed to override the contrary provisions hereof. If Section 704 or the Treasury Regulations at any time require that limited liability company operating agreements contain provisions which are not expressly set forth herein, such provisions shall be incorporated into this Agreement by reference and shall be deemed a part of this Agreement to the same extent as though they had been expressly set forth herein, and the Members shall amend the terms of this Agreement to add such provisions, and any such amendment shall be retroactive to whatever extent required to create allocations with a substantial economic effect. (a)Generally. The Managers, in their sole discretion, shall have the right, but not the obligation, to distribute Available Cash, or other Company assets to the Members, after setting aside the Reserves. The Managers shall be entitled, in their discretion, to make a distribution of the Company’s Available Cash, within 45 days following the end of each calendar quarter. All distributions shall be proportional to each Member’s Member Percentage. of the Members in making a determination of the estimated combined federal and state income tax liability of the Members, and shall make an assumption as to the “tax bracket” applicable to the Members as a group as provided. The amount of any distribution made to a Member pursuant to this Section 5.2(b) shall be deducted from the amount of any current or future distributions that would otherwise be made to such Member pursuant to this Article 5 or Section 10.4. (c)Withholding. The Managers may withhold from distributions to any Member any amount required to be withheld pursuant to the Code or any other law, rule or regulation. Any amount so withheld shall be treated as a distribution to the affected Member. 5.3.Final Distribution. The final distributions following dissolution of the Partnership shall be made in accordance with the provisions of Section 10.4. 6.1.Managers. Subject to the requirement to first obtain approval of the Majority in Interests to conduct certain activities as specifically set forth herein, the management of the Company shall be vested exclusively in the Managers, who shall continue to serve as Managers until their resignation or removal pursuant to Section 6.4 hereof. The initial Mangers shall be as set forth in the definition of Managers in Article 1 hereof. In the event of the resignation, withdrawal or removal of any Manager, his or her replacement shall be appointed pursuant to Section 6.4 hereof. 6.2.Management Authority of the Managers. (a)Subject to the terms and conditions of this Agreement, the management of the Company will be vested exclusively in the Managers, who will have full control over the business and affairs of the Company. The Managers will have the sole, full and exclusive right, power and authority on behalf and in the name of the Company to carry out any and all of the objectives and purposes of the Company and to perform all acts and perform all contracts and other undertakings that, in their sole and absolute discretion, they deem necessary or advisable or incidental thereto. for the conduct of the affairs of the Company; provided that such arrangements do not result in a change in the respective Member Interests or result in the addition of new Members. (xxiv)carry on any other activities necessary or incidental to, or in connection with, any of the foregoing or the Company’s business. All determinations and judgments made by the Managers in good faith and in accordance with the terms of this Agreement shall be conclusive and binding on all Members. 6.3.Management Authority of the Members. Only the Managers shall have the authority to bind the Company. No action of any Member in its capacity as a Member shall bind the Company, and each Member shall indemnify the Company for any costs or damages incurred by the Company as the result of any unauthorized action of such Member. Notwithstanding such limitations, the actions described in Section 6.2 (iv, ix, xxii, xxiii, xv, xxii, and xxiii) above, shall require the approval of a Majority in Interests. 6.4.Resignation, Withdrawal or Removal of a Manager. (a)A Manager may resign or withdraw at any time by giving thirty (30) days’ prior written notice to the Company. The resignation of a Manager shall take effect upon the expiration of thirty days from the date of receipt of such notice by all Members or at any later time specified in such notice. Unless otherwise specified in such notice, the acceptance of the resignation shall not be necessary to make it effective. A Manager’s resignation or withdrawal shall not dissolve or terminate the Company but rather a successor Manager shall be appointed to serve as, and to perform, the duties of the Manager hereunder effective upon such resignation or withdrawal. Any successor Manager(s) shall have the same rights, duties and obligations as the Managers has with respect to the Company. The successor Manager shall be appointed in the manner set forth in Section 6.4(d). of the Company. Subsection (iii) shall include any conduct that is likely to result in either civil, criminal penalties, or such other conduct that would reasonably be expected to injure the reputation, business or business relationships of the Company or any affiliate thereof, but not if such conduct is a direct result of the Company’s business. For the avoidance of doubt, Subsection (iii) excludes activities that are authorized or are otherwise consented to by the Managers, in accordance with the terms and provisions of this Agreement. (c)The bankruptcy or insolvency of a Manager shall not dissolve or terminate the Company but rather a successor Manager or Managers shall be appointed to serve as and to perform the duties of the Manager(s) hereunder effective upon such applicable event. Any successor Managers(s) shall have the same rights, duties and obligations as the Manager has with respect to the Company. (d)In the event of the resignation, withdrawal or removal of the NBGV Designee, NBGV shall have the sole right to appoint a replacement Manager. In the event of the resignation, withdrawal or removal of the EcoX Designee, EcoX shall have the sole right to appoint a replacement Manager. In the event of the resignation, withdrawal or removal of the Independent Designee, the Majority in Interests shall have the right to appoint a new Manager. so long as, in so relying, such Manager shall be acting in good faith and with the degree of care specified above. However, a Manager shall not be considered to be acting in good faith in so relying if such Manager has knowledge of the matter in question that would cause such reliance to be unwarranted. 6.6.Interested Manager(s). No contract or other transaction between the Company and a Manager, or between the Company and any other Person in which a Manager is a Manager, officer, or director, or has a substantial financial interest, shall be either void or voidable if such contract or transaction is approved by or consented to by the other Manager, or was fair and reasonable to the Company. (iii)the management or conduct of the business and affairs of any Related Person insofar as such business or affairs relate to the Company, any other Person in which the Company has a direct or indirect interest or to any Member in its capacity as such. (b)Conflicts of Interest. For purposes of this Agreement, no action or failure to act on the part of any Related Person in connection with the management or conduct of the business and affairs of such Related Person or any other Related Person and no other activities of such Related Person which involve a conflict of interest with the Company or any other Person in which the Company has a direct or indirect interest shall constitute, per se, bad faith, gross negligence, intentional misconduct, a material breach of this Agreement or a knowing violation of law. (c)Employees and Agents. Notwithstanding the foregoing provisions of this Section 6.7, no Related Person shall be liable to the Company, any other Person in which the Company has a direct or indirect interest, or to any Member (or any Affiliate thereof) for any action taken or omitted to be taken by any other Related Person. (d)Reliance on Third Parties. Any Related Person may (in its own name or in the name of the Company) consult with counsel, accountants, appraisers and other professional advisors in respect of the affairs of the Company and any other Person in which the Company has a direct or indirect interest and each Related Person shall be deemed not to have acted in bad faith or with gross negligence or to have materially breached this Agreement or engaged in intentional misconduct with respect to any action or failure to act and shall be fully protected and justified in so acting or failing to act, if such action or failure to act is in accordance with the advice or opinion of such counsel, accountants, appraisers or other professional advisors, except for actions or failures to act by such Related Person which constitute a knowing violation of law, provided that such advisors were selected with reasonable care. source shall reduce the amount of the Company's indemnification hereunder. Such attorneys’ fees and expenses shall, in the sole discretion of the Managers, be paid by the Company as they are incurred upon receipt, in each case, of a written undertaking by or on behalf of the Related Person on whose behalf such expenses are incurred to repay such amounts if it is finally adjudicated by a court of competent jurisdiction that indemnification is not permitted by law or this Agreement. (b)The termination of any proceeding by settlement shall be deemed not to create a presumption that the Related Person involved in such settlement acted in a manner which constituted bad faith, gross negligence, intentional misconduct, material breach of this Agreement or a knowing violation of law. The indemnification provisions of this Section 6.8 may be asserted and enforced by, and shall be for the benefit of, each Related Person, and each Related Person is hereby specifically empowered to assert and enforce such right, provided that any Related Person who fails to take such actions as the Managers may reasonably request in defending any claim or who enters into a settlement of any proceeding without the prior approval of the Managers (which shall not be unreasonably withheld) shall not be entitled to indemnification provided in this section. The right of any Related Person to the indemnification provided herein shall be cumulative of, and in addition to, any and all rights to which such Related Person may otherwise be entitled by contract or as a matter of law or equity and shall extend to his or its heirs, successors, assigns and legal representatives. 6.9.Contribution. If for any reason the indemnity provided for in Section 6.8 and to which a Related Person is otherwise entitled is unavailable to such Related Person (other than for reason of such Related Person acted in a manner which constituted bad faith, gross negligence, intentional misconduct, material breach of this Agreement or a knowing violation of law) in respect of any Damages, then the Company, in lieu of indemnifying such Related Person, shall contribute to the amount paid or payable by such Related Person as a result of such Damages in the proportion the total capital of the Company (exclusive of the balance in the Related Person’s Capital Account (which, for purposes of this Section 6.9, in the case of a Related Person which is not a Member, shall mean the Managers’ Capital Account, if any, if the Related Person is an Affiliate thereof)) bears to the total capital of the Company (including the balance in the Related Person’s Capital Account), which contribution shall be treated as an expense of the Company. 6.10.Assets of the Company; Insurance. The Managers have the right in their sole discretion to satisfy any right of indemnity or contribution granted under Section 6.8 or Section 6.9 or to which it may be otherwise be entitled out of the assets of the Company. The Managers may obtain appropriate insurance on behalf of the Company to secure the Company’s obligations hereunder. 6.11.Not Liable for Return of Capital. Neither the Managers nor any other Related Person shall be personally liable for the return of the Capital Contributions of any Member or any portion thereof or interest thereon, and such return shall be made solely from available Company assets, if any. 6.12.Transactions with Affiliates; Acknowledgment; Reimbursement of Expenses. (a)The Managers shall have the authority to engage any other Member or any Affiliate to provide services to the Company, provided that the costs of such services are on terms no less favorable to the Company than the Company could obtain from an unrelated third party providing similar services and that such services are obtained in accordance with applicable law. (b)The Company shall pay, or reimburse the Managers for, all expenses incurred by the Company in the ordinary and usual course of business. The Company shall also pay, or reimburse the Managers for, all costs and expenses incurred in the organization of the Company and the sale of the Member Interests including, without limitation, legal and accounting fees, expenses of printing and mailing, costs of regulatory compliance with securities laws and all other related miscellaneous costs and expenses. Costs incurred by the Company in accordance with this Agreement shall be allocated by the Managers among the Members on a pro rata basis in accordance with their respective Member Percentages. 6.13.Activities of Managers; Other Ventures. (a)The Managers and their respective Affiliates (including any members, partners, officers, directors and shareholders of such Persons), employees or other agents shall devote so much of their time to the affairs of the Company as in the judgment of the Managers the conduct of the Company’s business shall reasonable require. The Managers shall not be obligated to do or perform any act or thing in connection with the business of the Company not expressly set forth herein or in any agreements ancillary hereto. Nothing contained herein shall be deemed to preclude the Managers or, as the case may be, any of their respective Affiliates, employees or other agents from engaging directly or indirectly in any other business. No Member shall, by reason of being a Member, have any right to participate in any manner in the profits or income earned or derived by or accruing to the Managers or their respective members or any of their, as the case may be, officers, directors, shareholders, members, partners, Affiliates, employees or other agents from the conduct of any business other than the business of the Company. (b)Neither the Managers nor any of their respective Affiliates shall be obligated to present any particular investment opportunity to the Company. The Members hereby expressly waive any claim of conflict of interest or similar claim arising out of or related to any transactions entered into by the Managers and/or their respective Affiliates. 7.1.General. There is no requirement hereunder that any annual or other periodic meeting of the Members be held. Rather, the Managers may call a meeting of the Members at any time or from time to time, and such a meeting or meetings shall be called by the Managers if Members holding a Majority in Interests request the Managers to do so in writing. Unless otherwise determined by the Managers, all meetings of the Members shall be held at the principal office of the Company. Any one or more Members may participate at a meeting of the Members by means of conference telephone or similar communications equipment by means of which all persons participating in the meeting can hear each other. Such participation shall constitute presence in person at the meeting. Any Member may participate at any meeting by proxy. (ix)the actions described in Sections 6.2 (iv, ix, xxii, xxiii, xv, xxii, and xxiii). (b)the affirmative vote or Consent of a Majority in Interests of Members shall be required to remove a Manager pursuant to Section 6.4(b). (c)Each Member shall have the right of first refusal to purchase the other Member’s Member Interest before it can be sold to a third party, as described in Section 9.2. 7.3.Quorum. A Majority in Interests shall constitute a quorum at all meetings of the Members. When a quorum is present to organize a meeting, it will not be considered to be broken by the subsequent departure of any Member(s). The Members present at a meeting at which a quorum is not present may adjourn the meeting despite the absence of a quorum. 7.4.Notice of Meeting. Notice of all meetings shall be given to the Members entitled to attend such meeting not less than five (5), nor more than sixty (60), business days before the date of the meeting. Each such Notice shall state the place, date and hour of the meeting and the purpose or purposes for which the meeting was called. Any affidavit of the Managers that the Notice required by this Section has been given shall, in the absence of fraud, be prima facie evidence of the facts therein stated. When a meeting is adjourned to another time or place, it shall not be necessary to give any Notice of the adjourned meeting if the time and place to which the meeting is adjourned is announced at the meeting at which the adjournment is taken. At the adjourned meeting, any business may be transacted that might have been transacted at the original date of the meeting. Notice of a meeting need not be given to any Member who submits a signed waiver of Notice, in person or by proxy, whether before or after the meeting. The attendance of any Member at a meeting, in person or by proxy, without protesting prior to the conclusion of the meeting the lack of Notice of such meeting, shall constitute waiver of Notice by such Member. 7.5.Action by Members Without a Meeting. Any action that is required or permitted to be taken by vote of the Members may be taken without a meeting, without prior Notice and without a vote, if a Consent or Consents setting forth the action so taken shall be signed by Members holding Member Interests constituting not less than the minimum percentage of Member Interests that would be necessary to authorize such action at a meeting at which all of the Members were present and voted. Each such Consent shall bear the date of signature of each Member who signs the Consent, and no Consent shall be effective to take the action referred to therein unless, within sixty (60) days of the earliest dated Consent, Consents signed by a sufficient number of Members to take the action are duly given. Prompt Notice of the taking of any action without a meeting by less than unanimous Consent shall be given to all of the Members. 7.6.Duties and Obligations of Members. (a)Each Member shall provide or cause to be provided to the Managers, promptly upon request by the Managers, information with respect to such Member and its Affiliates as the Managers deems necessary or appropriate to complete any tax returns or any reports, schedules, notices, proxy statements and other statements required to be filed by the Company under the Code or the Exchange Act, the Securities Act or the Rules and Regulations, or for any other purpose. Without limiting the generality of the foregoing, each Member shall provide Internal Revenue Service Form W-8, W-9, 1001 or 4224, as applicable, or any other form as may be reasonably requested by the Managers, promptly following such request. be required by law, or as may, in the opinion of the Managers, be necessary or desirable to carry out the intents and purposes of this Agreement. (c)Each Member shall cooperate in good faith, and shall do and perform, or cause to be done and performed, all such further acts and things, and shall execute and deliver all such other agreements, certificates, instruments and documents as may be reasonably requested by , for the furtherance of carrying the purpose set forth in Section 2.2 as the other party may reasonably request in order to carry out the intent and accomplish the purposes of this Agreement and the consummation of the transactions contemplated hereby. 8.1.Bank Accounts. The funds of the Company shall be deposited in such bank or brokerage account or accounts as the Managers may determine are required for the purpose, and the Managers shall arrange for the appropriate conduct of such accounts (including, without limitation, the designation of one or more signatories therefor). 8.2.Records. The books and records of the Company shall be kept at the Company’s principal place of business and/or at such other place as the Managers(s) shall designate. The books of the Company shall be kept in accordance with the method of accounting determined by the Managers. (a)The Company shall, as soon as practicable after the end of each fiscal year, provide the Members with annual financial statements and an annual report, delivered to their respective addresses set forth in the records of the Company, which report shall set forth, as of the end of such fiscal year, the following (and any other information which the Managers(s) may deem appropriate): (i) information in sufficient detail in order to enable the Members to prepare their respective Federal, state and other tax returns; and (ii) any other information which the Managers shall deem necessary or appropriate. The Company shall provide the Members with such interim reports as the Managers shall deem necessary or appropriate. (b)The Managers shall keep or cause to be kept at the principal place of business of the Company complete and accurate books and records of the Company. 8.4.Fiscal Year. The fiscal year (the “Fiscal Year”) of the Company shall be the calendar year. (a)The Members hereby appoint Robert Bench as the “partnership representative” as provided in Code Section 6223(a) (the “Partnership Representative”). The Members hereby appoint Robert Bench as the sole person authorized to act on behalf of the Partnership Representative (the “Designated Individual”). The Partnership Representative or Designated Individual can be removed at any time by a vote of the Managers. The Partnership Representative shall resign if he is no longer an officer of NBGV, and the Designated Individual shall resign if it is no longer an employee or officer of NBGV. In the event of the resignation or removal of the Partnership Representative or Designated Individual, the Managers shall select a replacement Partnership Representative or Designated Individual, as applicable. If the resignation or removal of the Partnership Representative or Designated Individual occurs prior to the effectiveness of the resignation or removal under applicable Treasury Regulations or other administrative guidance, the Partnership Representative or Designated Individual that has resigned or been removed shall not take any actions in its capacity as Partnership Representative or Designated Individual except as directed by the successor Partnership Representative. (b)The Partnership Representative or Designated Individual shall (i) not bind the Members to any tax settlement without the approval of a Majority in Interests; (ii) notify the Members, within 30 calendar days after it receives notice from the IRS, of any administrative proceeding with respect to an examination of, or proposed adjustment to, any Company tax items; (iii) provide the Members with notice of its intention to extend the statute of limitations or file a tax claim in any court at least 10 calendar days before taking such action; (iv) shall not extend the statute of limitations or file a tax claim without the approval of the Members; (v) notify the Members prior to submitting a request for administrative adjustment on behalf of the Company; and (vi) not submit a request for administrative adjustment on behalf of the Company without the approval of the Members. 8.6.Tax Examinations and Audits. Subject to the approval of Managers, the Partnership Representative is authorized and required to retain a third party firm to represent the Company (at the Company's expense) in connection with all examinations of the Company's affairs by Taxing Authorities, including resulting administrative and judicial proceedings, and to expend Company funds for professional services and costs associated therewith. Subject to the approval of the Managers, the Partnership Representative shall have authority to act on behalf of the Company in any such examinations and any resulting administrative or judicial proceedings, and shall have discretion to determine whether the Company (either on its own behalf or on behalf of the Members) will contest or continue to contest any tax deficiencies assessed or proposed to be assessed by any Taxing Authority. 8.7.Elections. The Partnership Representative shall promptly notify the Members of the receipt of a notice of final partnership adjustment and shall take such actions as directed by the Managers in writing, including whether to (i) file a petition for readjustment in the U.S. Tax Court, federal district court, or the Court of Federal Claims, (ii) cause the Company to pay the imputed underpayment under Code Section 6225, or (iii) make the election under Code Section 6226. If the Managers direct the Partnership Representative to cause the Company to pay the imputed underpayment under Code Section 6225 (i) the Managers shall take such actions as requested by the Partnership Representative, including filing amended tax returns and paying any tax due under Code Section 6225(c)(2)(A) or paying any tax due and providing applicable information to the Internal Revenue Service under Code Section 6225(c)(2)(B) and (ii) the Company shall use commercially reasonable efforts to make any modifications available under Code Section 6225(c)(3), (4), and (5). The Partnership Representative shall equitably apportion any imputed underpayment among the Members (including former Members) based on their interests in the Company for the year giving rise to the imputed underpayment. In determining each Member's share of an imputed underpayment, the Partnership Representative shall take into account (by reducing the amount of an underpayment apportioned to a Member) any modifications to the imputed underpayment attributable to a Member under Code Section 6225(c)(2), (3), (4), or (5). The Partnership Representative shall seek payment from the Members (and former Members) for the amount of the imputed underpayment attributable to that Member or former Member, and each such Member agrees to pay such amount to the Company. Any such payment made by a Member shall not be treated as a capital contribution. Any amount not paid by a Member or former Member within 60 days of a request by the Partnership Representative shall accrue interest at 18% per annum. Any imputed underpayment amount paid by the Company on behalf of a Member and not reimbursed by that Member shall be treated as a distribution to such Member. by such Member and if required to be paid (and actually paid) by the Company, will be recoverable from such Member. 8.9.Income Tax Elections. Except as otherwise provided herein, the Partnership Representative shall have sole discretion to make any determination regarding income tax elections it deems advisable on behalf of the Company; provided that the Partnership Representative shall make an election under Code Section 754, if requested in writing by the Managers. 8.10.Tax Returns. The Partnership Representative shall cause to be prepared and timely filed all tax returns required to be filed by or for the Company. 8.11.Survival. The obligations of each Member or former Member under this Article 8 shall survive the transfer or redemption by such Member of its Member Interest, the termination of this Agreement, or the dissolution of the Company. (c)the transfer (i) will not violate any provisions of the Securities Act, or applicable state securities laws; (ii) for Federal income tax purposes, will not cause the termination or dissolution of the Company and will not cause the Company to be classified as other than a partnership; and (iii) will not violate the laws of any state or the rules and regulations of any governmental authority applicable to such Transfers. (d)The non-transferring Member waives his, her, or its right of first refusal to purchase the transferring Member’s Member Interest, except where the transferring Member transfers the Member Interest to a Family Member or, in the case of a Member who is not a natural person, any partner, parent, subsidiary or Affiliate of such Member. (a)In addition and subject to the restrictions contained in the other provisions of this Article 9, and with respect to any Member, in the event that any Member (in its capacity as such, a “Transferring Member”) desires to Transfer all or a portion of its Member Interest (“Offered Interest”) other than pursuant to Transfers permitted by Section 9.1, and the Transferring Member has received a bona-fide arm's length written offer to purchase such Offered Interest, then the Transferring Member shall deliver written notice (a “Sale Notice”) to the other Member. The Sale Notice shall describe in reasonable detail the proposed offer including the Member Interests to be Transferred, the consideration to be paid, and the name and address of the proposed purchaser of the Offered Interest (“Proposed Transferee”). (b)The non-transferring Member shall have the right but not an obligation (such right, a “ROFR Right”) to purchase all or a part of the Offered Interest at the same price set forth in the Sale Notice from the Transferring Member and, if the price set forth in the Sale Notice references consideration other than cash, then the non-transferring Member may elect to pay the fair market value of such consideration in cash if it exercises the ROFR Right. To the extent the non-transferring Member desires to exercise the ROFR Right, it shall, within fifteen (15) Business Days of the receipt of the Sale Notice, deliver a notice to the Transferring Member setting forth the amount of Offered Interest it proposes to purchase on the terms and conditions set forth in the Sale Notice (such notice, the “Election Notice”). (c)In the event that the non-transferring Member delivers an Election Notice, then it shall negotiate in good faith and use commercially reasonable efforts to (i) enter into customary definitive documentation for the sale of the Offered Interest (that contains customary representations and warranties, covenants and indemnities) on the terms and conditions set forth in the Election Notice and (ii) consummate the sale of the Offered Interest as soon as practicable and, in any event, no more than 45 days after having received notice of the acceptance of the offer, which may be extended to the extent necessary to secure required governmental approvals. (d)If the non-transferring Member does not deliver an Election Notice, then, for a period of 90 days from the date the Election Notice was due, the Transferring Member may Transfer the Offered Interest to the Proposed Transferee set forth in the Sale Notice on terms the same as or no more favorable to the Proposed Transferee than those set forth in the Sale Notice. For the avoidance of doubt, in the event that a Transferring Member does not effect the Transfer of the Offered Interest within such 90 day period, then any Transfer shall again be subject to the provisions of this Section 9.2. 9.3.Admission of Transferee as Member. Subject to Section 9.6, any transferee of all, but not less than all, of the Member Interests pursuant to the terms of this Article 9 shall be admitted to the Company as a substitute Member. In such event, such substitute Member shall, to the extent of such transfer, succeed to the Capital Account, rights and obligations hereunder of the Member making such transfer. 9.4.Effective Date of Transfer. The Managers may, in their sole discretion, permit a Transfer otherwise approved by a Majority in Interests, or otherwise allowed pursuant to this Operating Agreement to become effective as of the first day of the Accounting Period following such Transfer. 9.5.No Dissolution. Admission of a substitute Member shall not be a cause for dissolution of the Company. 9.6.Attempted Transfer in Violation of Agreement. Any purported transfer of any Member Interest, in whole or in part, not made in accordance with this Article 9 shall be null and void ab initio and the Managers and all Members are authorized to continue to treat the purported transferor as a Member for all purposes of this Agreement. Consent may be withheld or delayed by the Managers in their sole discretion and the approval of a Majority in Interests. (a)A Member’s Interest may be redeemed for “Cause” as defined below. Such Redemption shall be effective (the “Effective Date”) five (5) Business Days after notice in writing thereof is given to such Member or Members (a “Redemption Notice”), unless such Redemption Notice is rescinded by the Managers not appointed by the Redeemed Member within such five (5) Business Day period. (iv)the material breach of this Operating Agreement or any other agreement with the Company by any Member, which breach is not cured (if capable of being cured) within thirty (30) days of receiving written notice thereof, or (v) a Member’s ownership of its Member Interest or any portion or aspect thereof is prohibited by Law. (b)Each Member that is given a Redemption Notice (a “Redeemed Member”) shall be entitled to receive in respect of such Redeemed Member Interests an amount equal to the Redemption Value (as defined below) determined as of the Effective Date. A Redeemed Member shall not have any right to receive any profits attributable to such Redeemed Member Interests or any Company assets after the Effective Date. (c)The redemption value (the “Redemption Value”) of Redeemed Member Interests shall be calculated based upon the balance of the Redeemed Member’s Capital Account as of the Effective Date adjusted as if (i) all the assets of the Company had been sold for their fair market value, (ii) all Company liabilities of the Company had been paid, and (iii) all allocations required by Article 5 in respect of the Member Interests had been made, all on the Effective Date. (d)Payment of the Redemption Value to Redeemed Members (“Redemption Payments”) shall be made in cash or in kind or in a combination thereof, at the sole option of the Managers not appointed by the Redeemed Member at the time of payment, and, to the extent paid in kind, the assets so distributed shall be valued at their fair market value as of the Effective Date. The Redemption Payment shall be paid not later than three months after the Effective Date, except in extraordinary circumstances. (f)Notwithstanding anything to the contrary set forth herein, in the event of a redemption of NBGV due to a breach by NBGV of Section 3.7, and for the avoidance of doubt, calculation of the Redemption Value shall exclude the value of the Intellectual Property. (h)The Managers will promptly notify each Member who has received a Redemption Notice and to whom payment in full of the amount being redeemed has not yet been remitted of any such suspension. The Managers not appointed by the Redeeming Member, in their sole discretion, may complete any Redemptions as of a date after the cause of any such suspension has ceased to exist to be specified by such Managers, in their sole discretion. 9.9.Withdrawal as a Member of the Company. (a)No Member shall have the right to withdraw as a Member of the Company without the express prior written Consent of the Managers, which Consent may be withheld or delayed by the Managers in its sole discretion and the approval of a Majority in Interests. (b)Any Member permitted to withdraw as a Member (a “Withdrawing Member”) shall be entitled to receive from the Company in respect of such Member Interests an amount equal to the Redemption Value of such Member Interests as of the Withdrawal Date (for purposes hereof, the term “Withdrawal Date” shall mean a date following the effective date of withdrawal as reasonably determined by the Managers, but in no event later than December 31 of the Fiscal Year during which the effective date of the withdrawal occurs). For purposes of this Section 9.9, the amount of the Redemption Value payable to a Withdrawing Member is hereinafter referred to as the “Withdrawal Payment.” The Withdrawing Member shall not have any right to receive any profits attributable to the use of such Member Interests or any Company assets after the Withdrawal Date. The Withdrawal Payment shall be payable in cash or in kind or in a combination thereof, at the sole option of the Managers at the time of payment, and, to the extent paid in kind, the assets so distributed shall be valued at their fair market value as of the Withdrawal Date. The Withdrawal Payment shall be paid not later than three months after the Withdrawal Date, except in extraordinary circumstances as determined in good faith by the Managers. (c)The Managers may deduct from any Withdrawal Payments a withdrawal fee equal to up to four percent (4%) of the Withdrawal Payment, in addition to any other charges incurred by the Company; provided, however, the Managers may waive such withdrawal fee in part or in whole in its sole discretion. The amount of any other charges retained by the Company in connection with any withdrawal, net of any actual costs and expenses of processing the withdrawal, shall be allocated among and credited to the Capital Accounts of the remaining Members in accordance with their respective Member Percentages at such time. (e)The Managers will promptly notify each Member who has submitted a withdrawal request and to whom payment in full of the amount being withdrawn has not yet been remitted of any suspension of withdrawal or distribution rights. The Managers, in its sole discretion, may allow any such Members to rescind their withdrawal request to the extent of any portion thereof for which a Withdrawn Payment has not yet been distributed. The Managers, in its sole discretion, may complete any withdrawals or distributions as of a date after the cause of any such suspension has ceased to exist to be specified by the Managers, in its sole discretion subject to the approval of such withdrawal request by a Majority in Interests. 10.1.Term. The term of the Company shall be perpetual, unless sooner dissolved and liquidated in accordance with the provisions hereof. All provisions of this Agreement relating to dissolution and liquidation shall be cumulative; that is, the exercise or use of one of the provisions hereof shall not preclude the exercise or use of any other provision. 10.2.Death, Incompetency, Bankruptcy, Disability or Dissolution of a Member. The death, adjudication of incompetency, Bankruptcy, disability, termination or dissolution of a Member shall not dissolve or terminate the Company. The legal representative of any such Member shall succeed as assignee to such Member’s Member Interest in the Company but shall not be admitted as a Member unless the requirements of Section 9.1, as applicable, are met. (d)at the election of EcoX, in its sole discretion, if NBGV has failed to contribute the Working Capital Contribution in accordance with Section 3.7. Any dissolution of the Company shall be effective on the date the event occurs giving rise to the dissolution, but the Company shall not terminate until all of its affairs have been wound up and its assets distributed as provided in this Article 10.
distribution priorities set forth in, and after making all allocations required by, Article 5 of this Agreement, after giving effect to the distribution to EcoX of the Intellectual Property as set forth above, if applicable.. Notwithstanding any to the contrary set forth herein, in the event of a dissolution of the Company in accordance with Section 10.3(d), NGBV shall have no rights in or to the Intellectual Property, and the Company shall transfer the Intellectual Property back to EcoX prior to any liquidation without any payment or compensation to NBGV whatsoever. In such event, any remaining assets of the company will be liquidated and distributed in accordance with the provisions above. Nothing in this paragraph shall affect the rights of NGBV under the License Agreement entered into by and between NBGV and EcoX on February 14, 2019. 10.5.Certificate of Dissolution. Within ninety (90) days following the dissolution and commencement of winding up of the Company, or if at any time there are no Members, certificate of dissolution shall be filed with the Secretary of State of Nevada pursuant to the NLLC. than all of the Member Interests then a Majority in Interests must approve the sale and, if approved, the Members shall participate pro rata based on their respective ownership percentage. (b)If the Managers determine, in their sole discretion, that a Member is not complying with its obligations under Section 10.6(a), then the Managers shall have the right to put forth a proposal to the Members for approval by a Majority in Interests to redeem all of such Member Interests held by the Member and to cause them to be sold in the Third Party Sale to the Proposed Purchaser. In the event of a redemption pursuant to this Section 10.6(b), the Member so redeemed shall receive for its Member Interests the amount paid for such Member Interests by the Proposed Purchaser, provided, however, that the Managers may deduct from any such payment any resulting costs including, but not limited to, legal expenses, associated with such redemption. (b)That, at the time the Member purchases its Member Interests, the Member will be an “accredited investor” as defined in Rule 501(a) promulgated under the Securities Act and the Member will promptly notify the Company if there is a change to this status in the future. 11.2.Approvals. Unless otherwise specified in this Agreement, all approvals or Consents permitted or required to be given under this Agreement shall not unreasonably be delayed, conditioned, or withheld. The Member Interests represented by this certificate are subject to, and may not be transferred except in accordance with, the provisions of the Operating Agreement of CleanWave Labs, LLC dated as of February 14, 2019 as the same from time to time may be amended, a copy of which is on file at the principal office of the Company. (b)In the event that a Member transfers its Member Interests in a manner approved by the Managers or is unable to locate their Certificate and wishes to have a replacement Certificate issued, a fee of $250 payable to the Company shall apply, unless waived by the Managers in their sole discretion. laws of any State or of the United States, or which the Managers shall deem advisable to execute or file, including without limitation all instruments which may be required to effectuate the formation, continuation, termination, distribution or liquidation of the Company. (a)It is expressly acknowledged by each Member that the foregoing power of attorney is coupled with an interest and shall survive any assignment by such Member of such Member Interest in the Company; provided, however, that if such Member shall assign all of his Member Interest in the Company and the assignee shall become a substituted Member in accordance with this Agreement, then such power of attorney shall survive such assignment only for the purpose of enabling the Managers to execute, acknowledge, swear to and file all instruments necessary or appropriate to effectuate such substitution. (b)No actions shall be taken by the Managers under the power of attorney granted pursuant to this Section that would have any adverse effect on the limited liability of any Member. In the event that the appointment conferred in this Section 11.4 would not constitute a legal and valid appointment by any Member under the laws of the jurisdiction in which such Member is incorporated, established or resident, upon the request of the Managers, such Member shall deliver to the Managers a properly authenticated and duly executed document constituting a legal and valid power of attorney under the laws of the appropriate jurisdiction covering the matters set forth in this Section. Each Member hereby releases each Managers from any liability or claim in connection with the exercise of the authority granted pursuant to this power of attorney, and in connection with any other action taken by such Managers pursuant to which such Managers purports to act as the attorney-in-fact for one or more Members, if the Managers believed in good faith that such action taken was consistent with the authority granted to it pursuant to this Section 11.4. 11.5.Binding Agreement. Subject to the restrictions on transfers and encumbrances set forth herein, this Agreement shall inure to the benefit of, and be binding upon, the undersigned Members and their respective heirs, executors, legal representatives, successors and assigns. Whenever, in this Agreement, a reference to any party or Member is made, such reference shall be deemed to include a reference to the heirs, executors, legal representatives, successors and assigns of such party or Member. 11.6.Counterparts. This Agreement may be executed in any number of counterparts, each of which shall be deemed to be an original, and all of which shall constitute one and the same document. In the event that any signature (including a financing signature page) is delivered by facsimile transmission or by e-mail delivery of a data file, such signature shall create a valid and binding obligation of the executing party (or on whose behalf such signature is executed) with the same force and effect as if such facsimile or data file signature page were an original thereof. 11.7.Effect of Consent or Waiver. No Consent or waiver, express or implied, by any Member to or of any breach or default by any other Member in the performance by such other Member of his, her, or its obligations hereunder shall be deemed or construed to be a Consent or waiver to or of any other breach or default by such other Member in the performance by such other Member of the same or any other obligations of such Member hereunder. Failure on the part of any Member to object to, or complain of, any act or failure to act of any of the other Members, or to declare any of the other Members in default, irrespective of how long such failure continues, shall not constitute a waiver by any such Member of his, her, or its rights hereunder. 11.8.Enforceability. If any provision of this Agreement, or the application thereof to any Person or circumstances, shall be held to be invalid or unenforceable to any extent, the remainder of this Agreement, and the application of such provisions to other Persons or circumstances, shall not be affected thereby and shall be enforced to the greatest extent permitted by law. and they shall not be bound by any terms, conditions, statements, or representations, oral or written, not herein contained. (iii)no amendment of this Agreement and/or of any certificate(s), document(s), instrument(s) and/or other writing(s) executed by the Members in connection herewith (including, without limitation, the Certificate of Formation) shall or may render any one or more of the Members liable, in their capacity as Members and/or Managers(s), for any or all of the debts, obligations and/or liabilities of the Company and/or of any of the other Members (whether arising in tort, contract, or otherwise) without the Consent of each of the Members adversely affected thereby. 11.11.Governing Law. This Agreement is made and shall be construed under, and in accordance with, the laws of the State of Nevada for contracts made and to be wholly performed therein. (ii)such Member personally gained in fact a financial profit or other advantage to which such Member was not legally entitled. 11.13.No Partnership Intended for Non-Tax Purposes. The Members hereby recognize that the Company will be a partnership for United States Federal income tax purposes, and that the Company will be subject to all of the provisions of Subchapter K of Chapter 1 of Subtitle A of the Code; provided, however, that the Managers may, upon approval of a Majority in Interests, cause the Company to make an election under Internal Revenue Code Section 761(a) and Internal Revenue Regulation Section 1.761-2 to exclude the Company from the application of Subchapter K. One effect of such an election, if made, is that Members will not receive a Schedule K-1 with respect to their ownership of Member Interests in the Company. However, the Members expressly do not intend hereby to form a partnership, and neither anything contained herein nor the filing of United States Partnership Returns of Income by the Company shall be deemed or construed to alter the nature of the Company or to expand the obligations or liabilities of the Members. Without intention to limit the generality of the foregoing in any respect, the Members do not intend to be partners to one another, or partners as to any third party. To the extent that any Member, by word or action, represents to another Person that any other Member is a partner or that the Company is a partnership, the Member making such wrongful representation shall be liable to any other Member who incurs personal liability by reason of such wrongful representation. (c)certified or registered mail, return receipt requested; or (d) first-class postage prepaid. Changes of address shall be given to the Company and the Members by written Notice in accordance with the terms of this Section 11.14. Time periods shall commence on the date that such Notice is received; if delivered by hand or by overnight courier service, and three (3) Business Days after mailing if mailed. Any Notice that is required to be given within a stated period of time shall be considered timely if delivered or refused before midnight, Eastern time, of the last day of such period. 11.15.References. References herein to the singular shall include the plural and to the plural shall include the singular, and references to one gender shall include the others, except where the same shall not be appropriate. 11.16.Titles and Captions. Titles or captions contained in this Agreement are for convenience only and shall not be deemed a part of the content of this Agreement. (a)Arbitration is final and binding on the parties. and any party’s right to appeal or to seek modification of rulings by arbitrators is strictly limited. (e)The panel of arbitrators will typically include a minority of arbitrators who were or are affiliated with the securities industry. (f)All controversies which may arise between the parties concerning this Agreement shall be determined by arbitration. Judgment on any award of any such arbitration may be entered in the courts of the State of Nevada or in any other court having jurisdiction of the Person or Persons against whom such award is rendered. (g)Any notice of such arbitration or for the confirmation of any award in any arbitration shall be sufficient if given in accordance with the provisions of this Agreement. The parties agree that the determination of the arbitrators shall be binding and conclusive upon them. ·EcoX’s intellectual property rights, including standard operating procedures, trade-secrets and know-how related to the Technology as specified in the Assignment and License Agreement dated February 14, 2019 valued at $ .